Get little readers flying higher with the colourful story of Shannon, whose magical pearls protect the sea. This simplified full-colour version of a bestselling Rainbow Magic story makes this favourite series available to younger readers. Your child will have a whale of a time exploring the ocean with Shannon and her friends, on the hunt for her enchanted pearls. A great way to improve reading skills and build loyalty to a series children can enjoy for years to come. 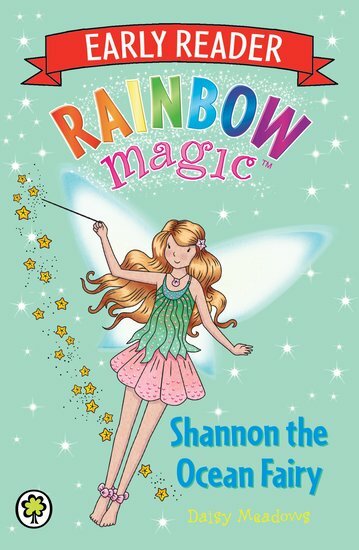 I really enjoyed this book it was great having 3 stories about Shannon the Ocean Fairy in 1 book. I liked the book because it had lots of colourful pictures and I could read the story myself with a little help. Rachel and Kirsty were on holiday when the Goblins got up to no good stealing The Dawn Pearl, The Twilight Pearl and The Moon Pearl. Rachel and Kirsty helped Shannon the Ocean Fairy to get the pearls back from the Goblins. When the Pearls are returned everything returns back to normal. I loved when Shannon turns Rachel and Kirsty into Fairies. I think it was funny when the Goblins were scared and handed the pearls over. I also liked it when Shannon used seaweed to tie the Goblins up. This book is great for girls just learning to read on their own.